After serum deprivation for 48 h (A) or 24 h (B) MDA-MB-231 cells were treated with recombinant hGX (10 nM) in serum-free medium containing 0.1% FAF BSA for 24 h (A) or 96 h (B) in the presence or absence of the sPLA2 inhibitor varespladib (Var) at a final concentration of 50 μM. Quinacrine 2HCl is a lipophilic cationic drug with multiple actions that is commonly used as an anti-protozoal agent. 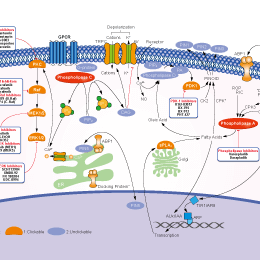 Quinacrine is an effective phospholipase A2 inhibitor. Tan-1 inhibited the migration of HMEC-1 cells (F). Cells were treated with vehicle (a), or Tan-1 12.5 μM (b), 25 μM (c) or 50 μM (d) in the corresponding left panel for 6 h. Magnification: 10×. The data from three independent experiments were expressed as mean ± SD in the corresponding right panel. *p < 0.05; **p < 0.01.